1. Happy Valentine’s Day friends! Hope you all have a love filled day full of hearts, flowers and chocolates. And more chocolates. And a few glasses of champagne. 2. It’s a 3 day weekend! And my birthday is Monday! We have the *best* weekend planned. We’ve rented the most amazing beach house in Bodega Bay for the long weekend. We’re going up with my sister and her husband, and another couple we’re great friends with. Our house has a view of the Pacific ocean on one side, and the golf course on the other side. Looking forward to a weekend of eating fresh seafood, kissing the boys goodbye as they go play golf and us girls go shopping, warm fires from the fireplace, the fresh ocean air, and enjoying a glass of wine on the beach watching the sunset. Is it time to leave yet?! 3. 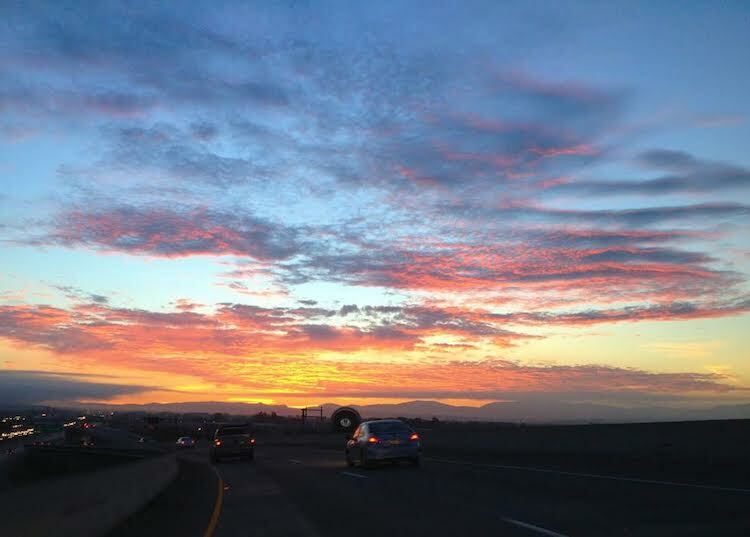 How beautiful was this sunrise on my way in to work yesterday? I love working so early in the morning. It means I get to see lots of sunrises. 4. 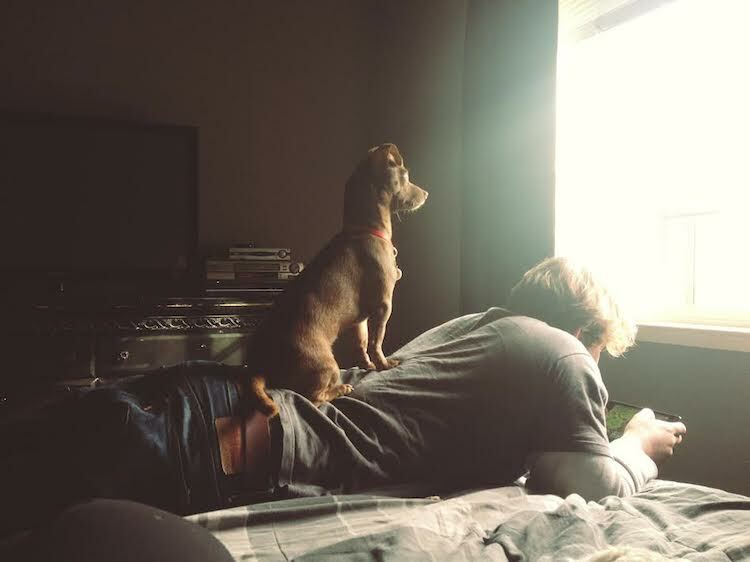 Max has no sense of personal space, and will do whatever it takes to keep his window lookout. Gotta love that about him. At least he’s light, you barely notice he’s there. 5. It rained a ton last weekend and early this week. California desperately needs rain, and it finally felt like winter around here. (Sorry to all of you battling snowstorms!) Was feeling a little cooped up in the rain, so I grabbed my camera and snapped some pics of the rainy scene outside. 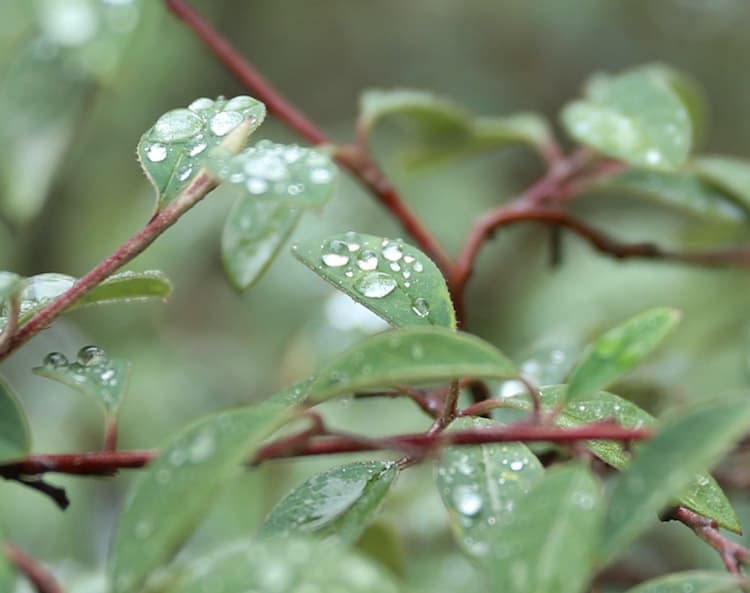 Especially loved these rain drops on the leaves. ohmygosh what a fun weekend girl! And happy early birthday! Oh, and your dog…mine does the same thing. No concept of personal space. Or manners. Happy Valentine’s Day and Birthday weekend Natalie! Hope you have a great time away celebrating this weekend! Love the beautiful sunrise and that picture of Max is adorable! Oh my goodness, your weekend sounds FAB! Hope you enjoy your birthday and have a great one. With such fun plans, I don’t know how you wouldn’t! Also, that sunrise is beautiful. Sounds like you are going to have an amazing weekend! Enjoy it! Btw–I love that last picture of the leaves—simply gorgeous! Three cheers for a wonderful birthday weekend, friend! Your plans sound amazing! Enjoy it to the fullest. That sunrise is ahhh-mazing. Love all those colors! I don’t get to see many vibrant sunrises, but the sunsets in SD are phenomenal. I just like to stand and watch until all the colors fade. Makes my heart smile! Happy Valentines Day, my dear!!! And, happy early birthday! It sounds like you have such an amazing weekend planned! I haven’t been to Bodega Bay, but I’ve heard it’s beautiful! Happy almost birthday! Sounds like such a fantastic weekend. Enjoy it!! enjoy the wonderful weekend chica, and happy early birthday!! What a great week-end. Cute dog! what beautiful photos! And Happy birthday for Monday! Have a great B-day weekend Natalie! Bodegabay sounds nice looking forward to hearing about your lovely trip. Natalie, I wanted to stop by and wish you Happy Birthday!!! I’m sure your enjoying your special day! Have a wonderful birthday celebration, Natalie. I hope you had a great weekend and birthday! Sounds like fun! It sounds like you had a great weekend! It sounds like fun! I hope you had an excellent weekend and bday sweetie! Love the dog picture. Dogs are too funny! Whatever it takes.